Sink your teeth into a gripping vampire adventure that is equal parts fantasy, romance and suspense! A vampire who longs to be human again, Todd is in the middle of proposing to Jessica, his one true love, when he’s kidnapped. Worse, Todd discovers that his close friend Zack, a charismatic and dangerous vampire, has sinister plans for Jessica. Now this desperate young lover must find his fragile fiancée and protect her from a terrible fate. Explore eerie locations, meet mysterious yet friendly characters, collect useful objects and solve brain-teasing puzzles as you experience an immortal love story with bite! Plot twists, great raphics, map, diary, hints, puzzles,, love story too!!!! I really enjoyed this game. Story was good, and so we're the graphics. Loved the "shooting" mini games for something different. Would buy a part two. It was fun, couldn't put it down. The problem with this was that it stopped in the middle of the game and told me to buy if I wanted to continue, once I did this it was another five minutes and it was over. I am mad about this because I didn't need to buy it. 5.0 out of 5 starsLove Cures Vamp! 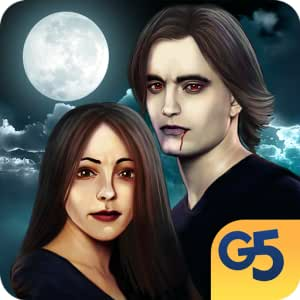 I enjoyed this Vampire and Human love game! Love overcomes even Zack the Vampire who is jealous of his young vampire Todd's love for Jessica, a sweet loving human. Zack has several reasons for his jealousy and mean ways of hurting the couple. Enjoy! This game is fine for all ages. Twists and turns of different types of hidden object, mini games with a good story. I'm truly enjoying it. This game is great; just what i was looking for. I love any game that has more than just the same routine. it has to be challenging or i will get bored. I always enjoyed games as a kid like carmen sandiego because it was more than just a puzzle it was an adventure you explore and travel all over the world looking for clues. Todd and Jessica's story is very similar, however I am a adult now and this is perfect not only does the game have a great interaction feature so the characters are actually communicating to each other but it has a plot and puzzles and quest too. You have to in some areas find the clues to match them with another clue (hidden object game) in order to move forward thats the challenge because its a hidden object game with a lot of entertainment along with it. I am only on the small part and im stuck and it is a great thing because now i will be challenged to move forward it is not as easy as some my find by looks. I am glad i downloaded this to my kindle. 3.0 out of 5 starsIntro Pricing for less than one day? I tried to ignore the obviously "Twilight" association (which would have immediately turned me off). Aside from that, the quality of the game was up to G5's usual standards Visually very good; enjoyed the puzzles and HO's (though not very difficult). But I am not going to pay $4.99 for your games when other companies provide very comparable (and sometimes better) games for $2.99 (and given the comment that the duration of the game after the free bit ends is short, I'm even more happy I didn't!). I do pay for G5 games when I can grab them at the intro price, which is generally for at least a few days! I snagged this one on Monday, March 31, when I saw first saw the email (received at 10:00 AM on Sunday, March 30) ... and went to unlock it immediately at the 40% discount only to find the price was $4.99! The 40% discount was only good until midnight of the day it was sent! It's hard not to feel that G5 is a bit arrogant in their approach and pricing. I'm not going to buy in on it. Like many others have commented, I think you are losing significant business! I play a lot of these games so in fairness I am going to say upfront this was not my type of game. The story seemed very "Twilight" with the vampire theme and young characters. The game was extremely easy, and didn't present even the slightest challenge. The voice acting was akin to listening in on a bad soap opera audition. The music was nice and graphics were decent, but the story was so cheesy, not to mention cliche (vampire falls desperately in love with a human, then she is kidnapped and he must rescue her). There are hidden object searches and mini games, which took me under a minute to solve. Again, I found this game way too easy. I had no technical issues playing on kindle fire HDX 8.9. There are hints, a map from which you can access any location by tapping, and a journal. Having said all that, I think there is a wide audience for this game and the romance novel type story. It's a good choice for beginners and probably younger players, but just didn't appeal to me personally. The full game is $2.99 right now, but you can try it for free, as always, and decide for yourself whether this is for you..